PixARK offers almost endless configuration of game mechanics, server settings, and more! There are multiple ways to configure PixARK, including startup arguments, world config files, game config files, and beyond. Startup arguments are always overriden by any config files. 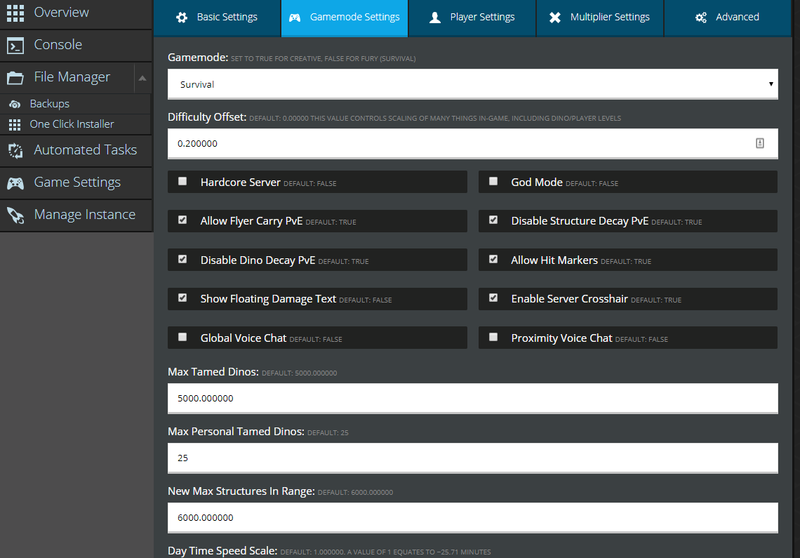 Many of these options are available for one-click configuration under the "Game Settings" section within NodePanel. There are many other configuration options available in the /ShooterGame/Saved/Config/WindowsServer/ directory as well as the /ShooterGame/Saved/CubeServers/CubeWorld_Light/world/ directory. For ease of use, we offer a great configuration UI for many of these configuration options with our high quality, one click PixARK server hosting within NodePanel. Check out our PixARK server hosting page for more information. As PixARK is in Early Access, more information about configuration options is being uncovered daily. Further documentation for these will be coming soon.